Well it’s the weekend again and the beginning of Spring Break for us. 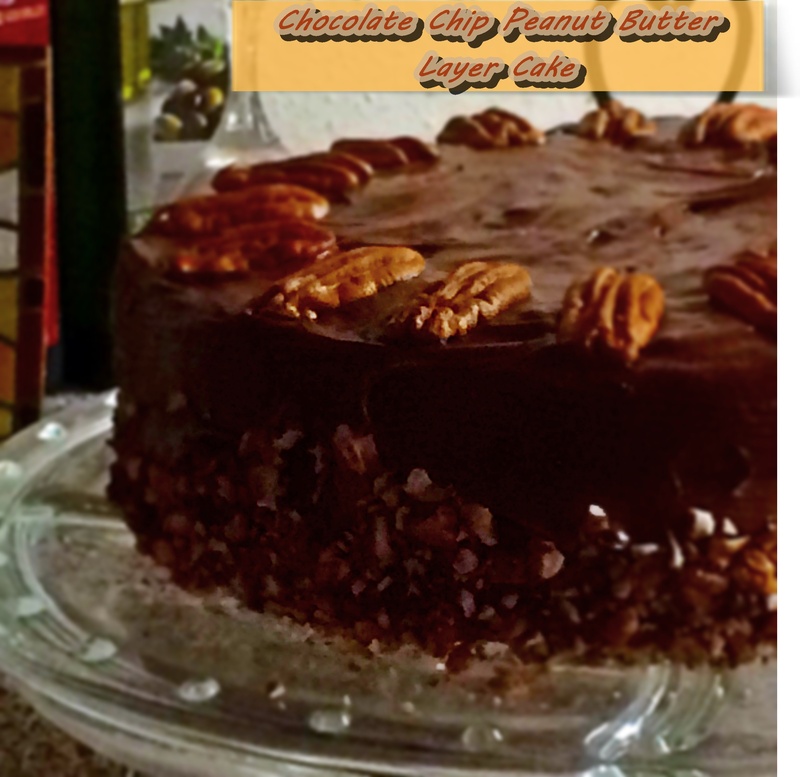 To kick off our spring break weekend I made two of our favorites; beef enchiladas (recipe later) and for dessert …Chocolate Chip Peanut Butter Layer Cake. It was the perfect dinner to start the weekend …a much-needed indulgence after a very difficult work week. This cake is a combination of several different recipes that I enjoy, rolled into one delicious, moist, easy to make cake. 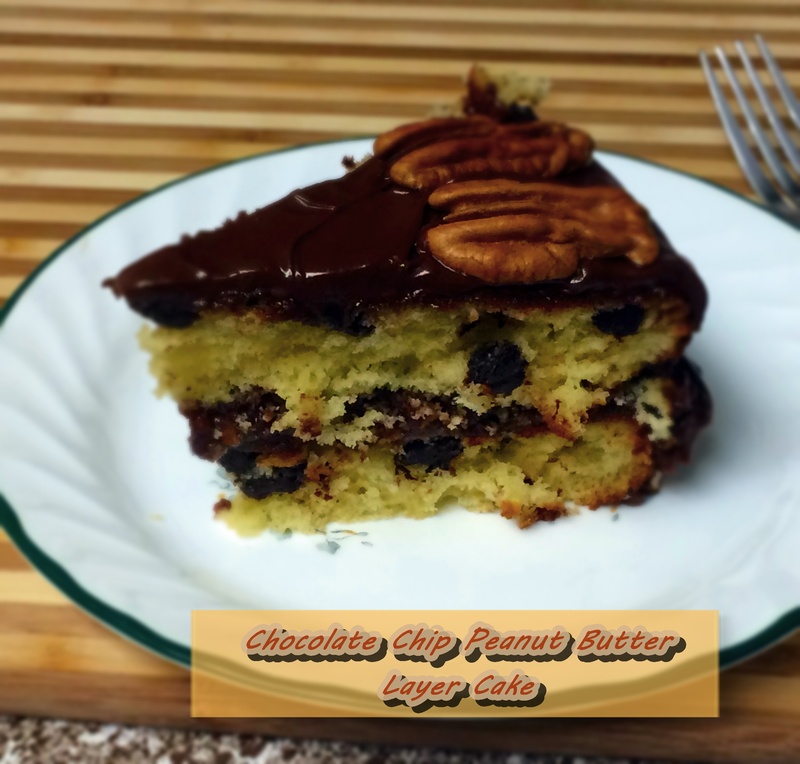 I made this recipe before using a yellow cake recipe, either box or scratch, but I found that the chips tend to end up all at the bottom making a chocolate chip upside down cake of sorts. You can remedy this by coating the chocolate chips in some flour before folding into batter. It will help the chips stay where you want them. Although this yellow cake recipe taste good, it just didn’t look as pretty and wasn’t quite what I was going for. I started using a pound cake recipe, it works perfect for the chocolate chips and the light and fluffy peanut butter chocolate frosting. My two sons loved the chocolate and peanut butter layer of frosting and gave the cake a thumbs up. It was a great choice to go along with the enchilada casserole. Preheat oven to 325 degrees. Spray 2 (8-inch) cake pans with cooking spray with flour. Whisk together flour (take out 2 Tablespoons of the flour), baking powder, and salt. Add the two Tablespoons of flour to the chocolate chips, and toss to combine. This helps the chips stay where they need to be, and not sink to the bottom. Cream the butter and sugar until light and fluffy, about 5 minutes. Scrape the sides, and add the eggs one at at time. Beat for 1 minute in between each egg on medium speed. Add the vanilla. Slowly add the flour mixture, and mix until just incorporated. It is not a bad idea to add the last bit of flour by hand. You want this cake to stay tender and over-mixing toughens it up. Fold in chocolate chips. Pour the batter evenly into the prepared pans. I insulate mine with baking strips and put them on a baking sheet. Bake for 50 to 60 minutes. Check on them around 30 minutes. If they are getting too brown, loosely tent some foil on top. The cakes are done when a knife comes out clean. Let the cake cool in the pans for 30 minutes. Turn the cakes out and let cool completely on a wire rack. Sift together the confectioners’ sugar and cocoa powder to assure there are no lumps. Set aside. Beat the butter on medium speed until creamy – about 2 minutes. Gradually add the sifted sugar/cocoa powder alternately with the heavy cream and vanilla. Beat on low speed after each addition. Once all added, beat on high speed until creamy and combined for at least 2 minutes. Add a pinch of salt if frosting is too sweet. 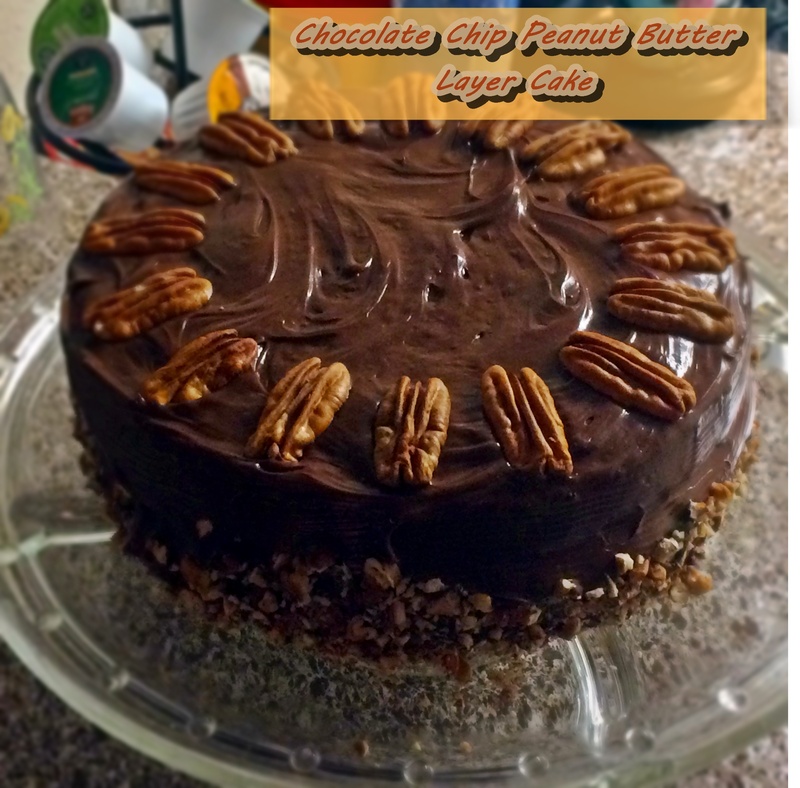 Lay one layer on a cake plate, and add about 1/2 cup of peanut butter frosting and 1/2 cup chocolate frosting. Spread evenly and add the second layer. Frost completely with remaining chocolate frosting. You’re an absolute killer first thing in the morning lady… damn that looks good!!! Haha! 😉 Thank you Jess! Yum! This cake looks so good and moist! Mamma mia this cake looks absolutely amazing! I don’t ever come here, but cake looks good. U useta come to my gigs, so, now, I can return the favor… bbox the elder is vewe vewe slow key board operation specialist..U r a Good person and a special 1 to me, never, ever forget that Darlin….Give yourself hug and kiss for me…#1 son as well, #2 son can prolly use a bit as well, so, feel free to give my love to all, you know who they are…YLX..haha!